This year I was asked to be a judge in the Debenhams Beauty Awards again, bringing you the highlights from the beauty industry and giving the nod of approval to much loved products. After a lengthy voting process (by both judges shortlisting and the public voting from the shortlist) the results are now in. You can see all the winners on the Debenhams Facebook page and even win the whole lot, worth a whopping £1,200! They’ve produced a little booklet which is being inserted into some of the best women’s mags, as well as making it available in store, so you can peruse the winners and make yourself a shopping list… Or should I say wish list? 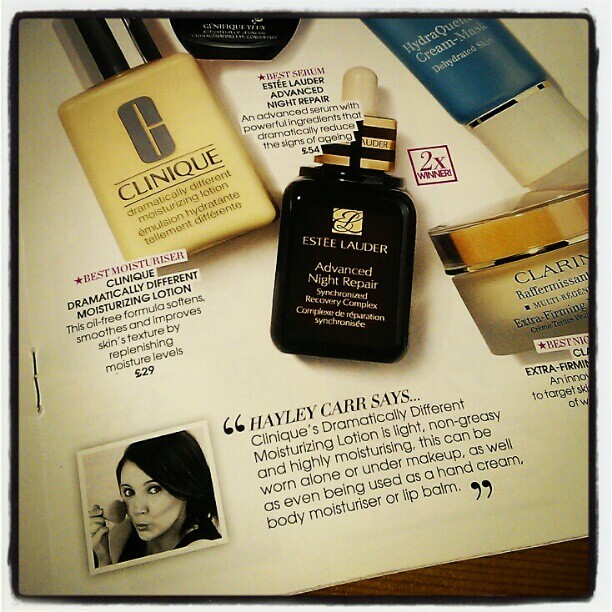 Here’s a sneaky peek of one of the pages when I’m praising Clinique’s Dramtically Different Moisturising Lotion. PS – check out the fact that they made a grammatical error in my quote! I really want to try that moisturiser! Wow, how lovely to be a judge, lucky you. The prize looks amazing, there are some fab products. Have you tried the Dramatically Different Gel? I was advised it as it seems to dry with more of a matte finish so great for slightly oilier skin to reduce the shine you can get from applying makeup.Congrats on being a judge again. I love that moisturizer too!